Euroluce at Milan Design Week happens every two years and it is one of the most popular events of the festival. As a Renaissance city, Milan is the perfect foil to the newest technologies in light, and a spectacular canvas for the many installations that unfold across the districts. This year lighting took to the stars, with constellations and sculptural nuance drawn from nature, or providing a counterbalance to it. more space headed inside the textural beauty of the concrete bunker that is Foscarini’s new Milanese showroom where the roughly finished formwork walls sparkled under light, and explored the latest collection by New York-based design group Roll & Hill that engages traditional craftsmanship and local makers across the United States. Pole designed by Philippe Malouin. In a quiet nod to sculptor Alexander Calder, is rigid yet flexible, its modular design allowing it to create giant curves. Photo © Roll & Hill. Founded in Brooklyn by designer Jason Miller, Roll & Hill is an independent player in the light world which gives it creative space. They work with a diversity of designers and a rich material palette of materials brass, bronze, leather, wood, hand-knotted rope and blown glass. 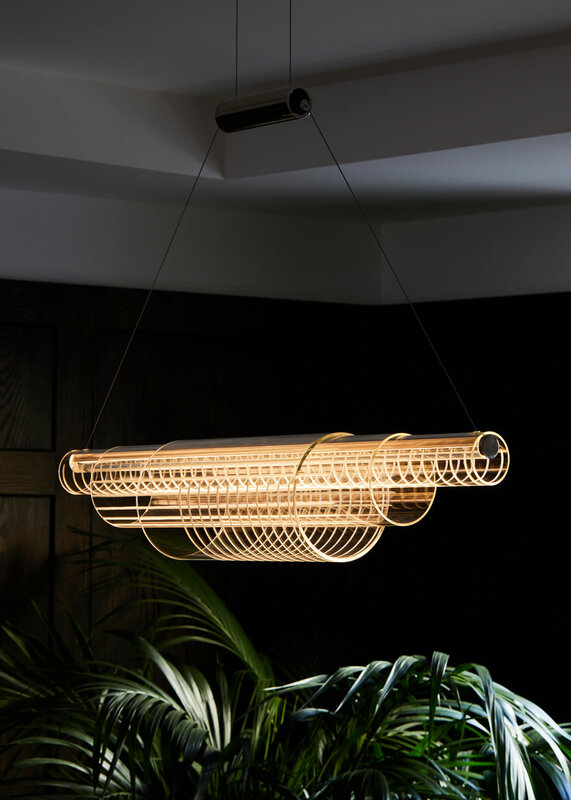 The effect is textural and pared back, the beauty is definitely in the detail While Roll & Hill’s designers often pair historical elements with contemporary forms to create lights that feel familiar and at the same time totally new. The Coax lamp designed by John Hogan, known for his minimal and often monolithic sculptural glass work, is a layered fixture made almost entirely from glass. Photo © Roll & Hill. Arbor designed by Karl Zahn for Roll & Hill. Photo © Roll & Hill. Highlights from the Roll & Hill collection include Arbor designed by Karl Zahn that explores linear forms interpreted in three dimensional space. At first glance the pendant appears full and dominates space but quickly reveals itself as warm and weightless. The exterior oak veneer juxtaposes the painted inside, warmed by illumination. Arbor’s technology is a novel solution that creates an extremely low profile “magic" light source with the thinnest available wires to exist liminally within the lamp's shell. The Coax lamp designed by John Hogan, who is known for his minimal and often monolithic sculptural glass work, sets out to create a layered, linear fixture that is made almost entirely from glass. The materials hang serenely, appearing weightless against each other. While Pole designed by Philippe Malouin. In a quiet nod to sculptor Alexander Calder, is rigid yet flexible, its modular design allowing it to create giant curves. 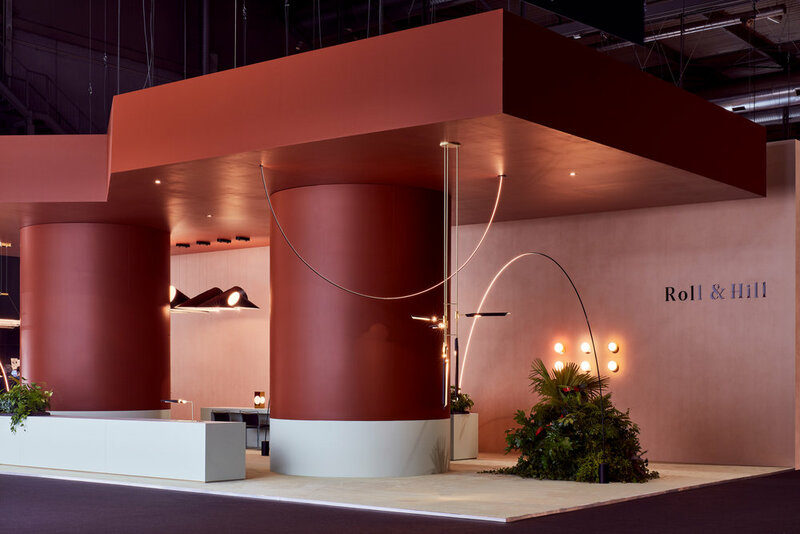 Rather than uplighting or area lighting, Pole illuminates a broad range of spaces in multiple configurations along walls, floors, and ceilings, the span of light so long that it can cross over an entire room. The endless possibilities of Pole provides an artful take on traditional lighting and giving the user the ability to span it in multiple configurations. The Nuée lamp (right) designed by Marc Sadler inside Foscarini’s new concrete-lined Milanese showroom. Photo © Foscarini. Uptown designed by Ferruccio Laviani for Foscarini. Photo © Foscarini. 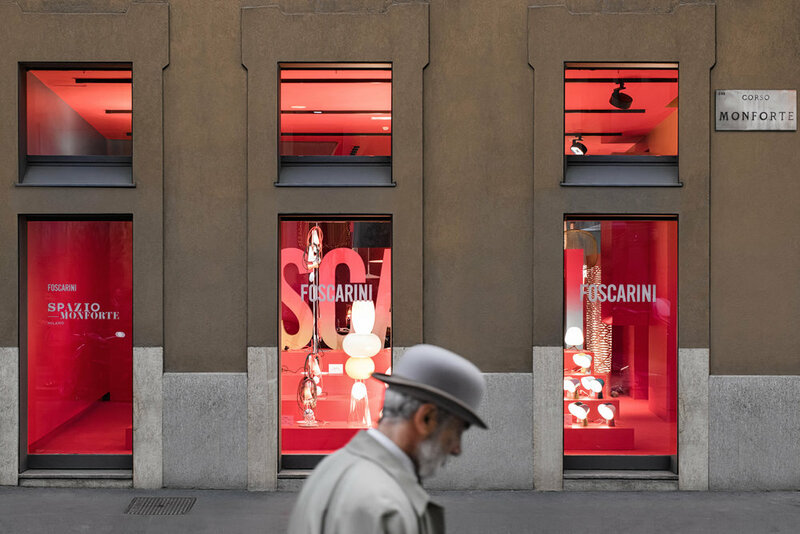 One of the most interesting lighting groups based in Italy, Foscarini has established itself working with designers like Patricia Urquiola and Ferruccio Laviani. This year its lighting designs by Andrea Anastasio, Ferruccio Laviani, Marc Sadler, and Ludovica and Roberto Palomba were revealed inside Foscarini’s new Milanese showroom on Corso Monforte designed by Laviani, a longtime collaborator of Foscarini, Lighting here was a diverse mix including Nuée by Marc Sadler, a cumulous cloud of light, made by overlapping three-dimensional technical fabric providing a soft and evocative glow; and Ferruccio Laviani’s Uptown, a self-described Art Deco meets Memphis extravaganza featuring semi-transparent knock-out pinks and oranges made in fluorescent plexiglass sheets. It is also worth noting that for the second year running, the Lee Broom design group has been awarded Best Lighting by Elle Deco magazine in a highly competitive selection process involving a judging panel of Elle Deco editors from around the world. This year the entire ‘Observatory’ collection was recognised in the award which includes the ‘Aurora’, ‘Eclipse’, ‘Lens Flair’, ‘Orion’, and ‘Tidal’ ranges which all began with prototypes of spherical silhouettes. The Eclipse light designed by Lee Broom is part of the Observatory collection that won an Elle Deco International Design Award for Best Lighting at Milan Design Week. Photo © Lee Broom. Inspired by an evening spent "stargazing with a friend in the Cotswolds”, the experience prompted a more focused look at halos of light and the idea of creating constellations that could be connected. The design approach for the Observatory collection revolves around the theme of the intersection of two chrome-covered steel and opalescent glass discs. Linked like a chain, the two elements of geometric form interact with the highly reflective surfaces, mirroring one another to present "all the magic of a bright jewel". Roll & Hill , Foscarini and Lee Broom are available exclusively from Space – Australia – and Space – Asia.